Corporate blogging is trendy. According to the 2011 State of Inbound Marketing, the share of businesses with a corporate blog grew from 48% to 65% between 2009 and 2011. Does that mean organizations have begun to understand the advantages of having a corporate blog? Not really. The market now offers a wide range of technologies that make it easy as pie to create a blog; so easy that a majority of companies set one up before asking themselves the most strategic questions. In this “5 reasons why” article series, I will uncover some of the most frequent mistakes encountered. After a couple of years blogging, I came to an obvious conclusion: most organizations have a blog simply because they feel they should. Some of them even think that a blog will naturally drive fresh organic traffic without too much investment. Thus, a vast majority of blogs just fail to perform, and are quickly ditched by their marketing managers, considered as an inefficient marketing tool. Fail. Let’s start with the harshest truth: your corporate blog is not a massive traffic generator, and acting like it is will lead you to complete failure. However, a blog is the most efficient tool for recurring traffic. Your readers will come back because they like the content you publish. It’s your mission to build yourself an image that will stick in their mind. Become a Thought Leader. If you lack of credibility and trust in your industry, your blog will be your best ally to reverse your image and make you look like an expert. To do so, you’ll have to publish relevant content about your industry, using figures, surveys, statistics, studies, and put your brand aside. 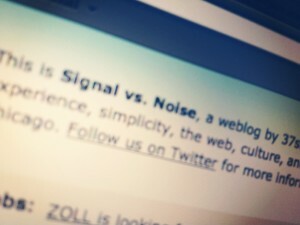 Some successful “thought-leader” blogs such as Signal vs. Noise almost never mention their brand in their blog. This strategy is extremely efficient for companies targeting B2B customers. It won’t generate any direct leads, but it will make it much easier for your sales force to get in touch with potential customers that already read some of your online content. Improve your Brand Awareness. This strategy is basically the opposite of the one mentioned above. In this case, you will create stories that you’ll use to incorporate your brand name and get your readers to know your products. 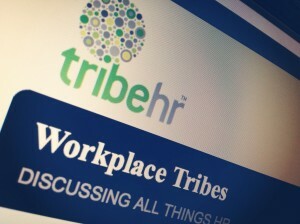 One of the first examples that comes to mind is the TribeHR blog. This blog highlights all the obstacles and questions faced by HR managers, and almost all of the posts end with a call-to-action inviting the reader to try their product. After several times visiting your blog to find answers, your readers will get to the point where they’ll consider your product as a way to solve their problems, and won’t hesitate to try it out. Create a Community. Building a community is one of the most difficult things to do with corporate blogging, but it’s also what will lead to the greatest loyalty rates, especially if you sell highly engaging products and have a massive consumer audience. Community members are the most cost-efficient evangelists you’ll ever have. Not only do they bring new customers to your base, but they also make them stay there by integrating them in the community. In order to get those evangelists to your community, you’ll have to create content that makes them feel they are special. My Starbucks ideas is one of the best examples of a blog only dedicated to building a community: readers are invited to brainstorm around the next innovations they’d like to see at Starbucks. The best ideas are released and the Starbucks bloggers then write about the success stories. 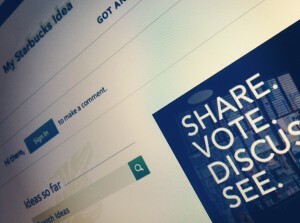 It encourages the community to get even more involved on the platform in the hopes of one day seeing their idea released and mentioned in the blog. The perfect virtuous circle! Thus, building a corporate blog requires some preparation: a social media strategy is not like any standard marketing plan. You first need to define what your objectives are and identify how your blog could bring value to your current marketing offer. However, the plan is just the initial phase of the entire process. The tricky part comes when you start implementing… To be continued next week!